The rivalry the last couple years between the Phillies and the Mets has been replaced this year now with the realization that the Mets are out of it for the season. Injuries and other situations have plagued the Mets this season and it wouldn't surprise me if the GM, Omar Minaya, and manager, Jerry Manuel, will be replaced at the end of the season. 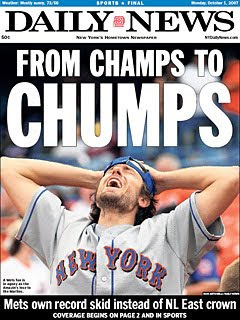 What had looked like a promising season for the Mets is now just wishful thinking for the fans of the amazins. Not only did the Mets team fail to live up to expectation this year, Citi Field has been panned as a place that real Mets fans can't even afford to get a decent seat to see a game because of the outrageous prices that the Mets owners have placed on the better seats at Citi. Also being panned is the dimensions of the field at Citi, "it's too big," say some people who know baseball. It's beautiful but that doesn't get a lot of good publicity when it comes to offensive production and home runs. What happens there next year is anyone's guess, it will be interesting to see if they start tinkering with the dimensions of that park to improve it's appeal. Last year the Mets beat the Phillies in the season series 11-7, so far this year the Phillies are ahead in the season series 10-5 going into this afternoon's game on Fox. The Phillies do an outrageous day/night doubleheader on Sunday. It's a nightmare for people that have the Sunday season ticket plan, they have to find a way to spend a long time between games if they are going to watch both games tomorrow. It is down to the wire for the Phillies as far as the regular season goes, they have 23 more games including this afternoon's Fox game. "It's a nightmare for people that have the Sunday season ticket plan, they have to find a way to spend a long time between games if they are going to watch both games tomorrow."